Space.com reporter Calla Cofield is thoroughly engrossed by ULA's virtual-reality view of a rocket launch. COLORADO SPRINGS, Colo. — This week, the 32nd Space Symposium took place in Colorado, but it might as well have been at Cape Canaveral. A virtual-reality app created by United Launch Alliance (ULA) dropped me onto a launchpad next to a Delta IV rocket, and watching it take off gave me nearly the same thrill as seeing a launch in person. Humans should never actually get as close to a rocket launch as I got to the Delta IV rocket that took off in the VR app. Cameras positioned at three different positions on or near the launchpad captured the explosive column of fire that erupted from the bottom of the rocket, and headphones blasted the booming sound. It was astounding to see the details of the rocket body and the pillar flame up close. Two of the cameras were quickly overwhelmed by smoke, but a third let me look up at the rocket as it became a smaller and smaller point of light overhead. The VR app is for the Oculus Rift virtual-reality headset, which provides a 3D, 360-degree view of the launch, meaning the user can "look around" while the video plays. Even though I knew I was just looking at a video, the responsiveness of the system to the movement of my head quickly suspended my disbelief. The ULA app is available for download from the company's website. Users who don't want to buy a VR headset can use Google Cardboard, which is an assemble-it-yourself cardboard VR headset (smartphone required). It's obviously less impressive than an actual VR headset, but much, much less expensive. ULA wasn't the only booth with a VR experience — Lockheed Martin also had a short VR tour of the facility where the Orion capsule is loaded onto a specially designed airplane called the "Super Guppy." Additionally, Lockheed Martin had a virtual-reality game in which players navigate a Mars rover along the surface of the Red Planet, trying to reach specific locations without tipping over the rover. Another game lets the user walk around a section of the Martian surface. The company is involved in the development of some very advanced virtual-reality tech, and is trying to use VR as part of STEM (science, technology, engineering and math) education and outreach. However, the programs we saw at the Space Symposium are not currently available to the public. A virtual reality game created by Lockheed Martin lets the user drive a rover around on the surface of Mars. However, anyone who wants to take a virtual tour of the Red Planet should consider visiting the Kennedy Space Center Visitor Complex this summer — the facility is opening a new exhibit called "Destination: Mars," in which visitors don VR headsets that give them a 3D, 360-degree virtual-reality view of the surface of Mars, created using real images taken by Red Planet rovers. Plus, the Red Planet tour is led by a VR projection of Buzz Aldrin! In addition, the exhibit will have a space where visitors (wearing the headsets) can walk around, making it seem as though they are really walking around on the surface of Mars. 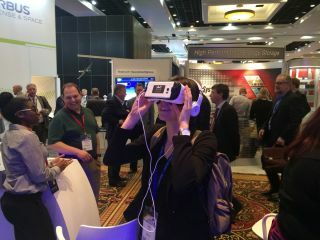 Finally, at the Space Symposium, NASA had a virtual-reality tour of the Space Launch System (SLS), the agency's new megarocket that will carry the Orion spacecraft. Once again, the VR tour isn't yet available to the public. A NASA representative said there were restrictions on how much information can be released about the rocket at this stage in its development, but he added that he'd like to see the VR tour made available in the next few years.